As one of the Cancer Research UK’s “core-funded” institutes, the Beatson Research Institute is committed to world-class research and the understanding of cancer cell behaviour. The Institute has very close links with the University of Glasgow’s Cancer Sciences Division and has recently moved into a fabulous purpose built new building (Best Public Building Silver Award - 2008 Roses Design Awards) within the University grounds. This award winning building was precision built and designed to provide scientists with the very latest technological resources to facilitate both their development and important research in to cancer cell behaviour. HBG Construction meticulously planned the perfect research unit incorporating a specialist temperature controlled environment. 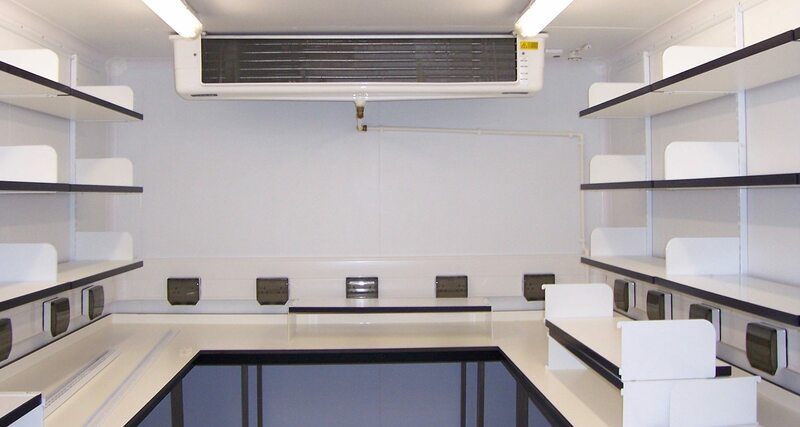 Having successfully completed the installation of sixteen temperature controlled chill rooms for the University of Glasgow’s Biomedical and Cardiovascular units previously, Williams Refrigeration were selected once again to install and commission seven temperature controlled rooms for the Beatson Unit. One very special room was commissioned on the second floor where the brief called for the room to be vibration free - isolated from the vibration of the buildings structure. To achieve this specific requirement, a ceiling mounted cooler pod was modified, located on isolated drop rods from the slab above, and the air conditioning air ducted via insulated, flexible ducts into the room . From here air was distributed via a “D” shaped textile cooling sock giving air movement of less than 0.5m/s.